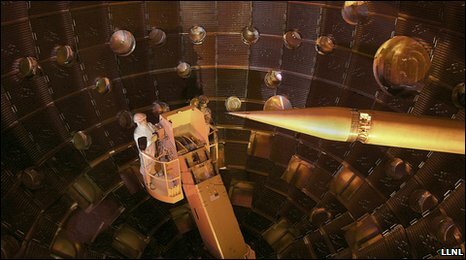 Early tests from the National Ignition Facility showed that a stable plasma could be created when focusing 192 separate lasers - an important step in controlled thermonuclear fusion. In the approach Nif takes, called inertial confinement fusion, the target is a centimetre-scale cylinder of gold called a hohlraum. It contains a tiny pellet of fuel made from an isotope of hydrogen called deuterium. The fear has been that the plasma, a roiling soup of charged particles, would interrupt the target's ability to absorb the lasers' energy and funnel it uniformly into the fuel, compressing it and causing ignition. Siegfried Glenzer, the Nif plasma scientist, led a team to test that theory, smashing records along the way. "We hit it with 669 kilojoules - 20 times more than any previous laser facility," Nif's Siegfried Glenzer told BBC News. That isn't that much total energy; it's about enough to boil a one-litre kettle twice over. However, the beams delivered their energy in pulses lasting a little more than 10 billionths of a second. Crucially, the recent experiments provided proof that the plasma did not reduce the hohlraum's ability to absorb the incident laser light; it absorbed about 95%. But more than that, Dr Glenzer's team discovered that the plasma can actually be carefully manipulated to increase the uniformity of the compression. The 130-tonne target chamber is kept under vacuum for the experiments "For the first time ever in the 50-year journey of laser fusion, these laser-plasma interactions have been shown to be less of a problem than predicted, not more," said Mike Dunne, director of the UK's Central Laser Facility and leader of the European laser fusion effort known as HiPER. "The output of each Pocket Accelerator is focused at the center of the Sonomak, in which the intersection cavication beams create a spherical region nearly devoid of electrons - you can picture it as a bubble in a sea of electrons. By careful manipulation of the laser pulse duration and frequency, this bubble can be made to pulse... during which the energy of the laser is coupled to the ions within the bubble, feeding them, causing them to rapidly heat." Via BBC; thanks to Rolf Redford for the tip and the reference for this story.